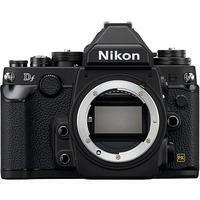 The Nikon Df is a retro-styled, full frame (FX) digital SLR camera that expresses a passion for photography in both form and function. Combined with a lightweight body, traditional dial-based handling and cutting-edge image technology, the Nikon Df places as much control in the photographer's hands as is practical. At the heart of the Nikon Df sits a 16.2MP sensor and EXPEED 3 image processor, which enables the camera to shoot images continuously at a rate of 5.5 fps, even in challenging conditions thanks to its weather sealed body and versatile ISO range of 100-12,800 (ext. up to 204,800).